Today's refashion was a gift from my coworker & friend, Pat. She teaches sewing workshop classes at my place of employment (I work full-time at a sewing shop and teach sewing lessons. Did you know that?) :) Anyhoo, she's a real seamstress, making all her own clothes through patterns. 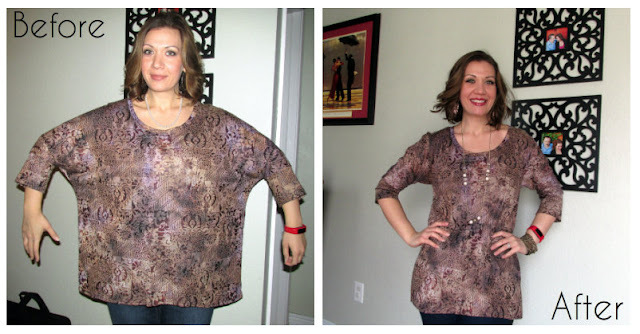 Recently, she gifted me this lovely dolman sleeve blouse. Pat didn't care for wingspan/severity of the dolman so she gave it to me. I actually love dolman sleeves, but I decided to just polish it up a bit to fit me better. I used the shoulder notches as a guide and made a cut all the way down, angling close to original hem for an A-line fit. Sew the left over raw edges, leaving a gap for the sleeves to be reattached to the arm holes. I put the newly fitted sleeve back in the arm hole with the Right Sides together and sewed them with a simple straight stitch. The sleeves are still slightly dolman... just a tighter fit. Pat approved :) (She made the awesome shirt she's wearing too). To see my full tutorial (And some of Pat's other awesome makings), check out my original post here. Great new top. The fabric is so pretty I am glad you were able to save it. Nice save! Looks great on you!